Please allow time for sound to load on this page…………..and keep the run-way clear. Merimbula is one of two main airports within the LAC. The other is located at Moruya. This airport is the main stream of freight to this part of the LAC and also many people commute to Sydney, Melbourne and Canberra on a daily basis. 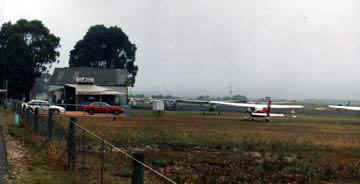 The airport is located a short distance from the main township of Merimbula and is along side the main Princes Highway. This airport proved its worth when it played its role ferrying out the sick and injured to larger hospitals after the Sydney to Hobart Yacht Race earlier this month, January 99.